CNN -- Singer Paul McCartney and Michael Jackson "kind of drifted apart," but there was "no big bust-up" after Jackson bought the Beatles song catalog, McCartney told David Letterman Wednesday. Paul McCartney and Michael Jackson in 1983. McCartney said Jackson will be missed. McCartney appeared on "The Late Show with David Letterman" to talk about his forthcoming concert at New York's Citi Field, the Beatles' 1964 appearance on "The Ed Sullivan Show" -- taped in the same theater -- and his relationship with Jackson. McCartney said the pair "fell apart" after Jackson secured rights to the Beatles catalog in 1985. Jackson outbid McCartney -- paying $47.5 million for it -- and then sold it to Sony Music for $95 million in 1995 while maintaining a 50 percent controlling interest. The relationship fizzled when McCartney asked for "a raise" from Jackson, to which Jackson -- in McCartney's word -- "blanked" the former Beatle and said, "That's just business, Paul," McCartney said. "We've never kind of got to it, and I thought 'hmmm,' so we kind of drifted apart," said McCartney. "There was no big bust-up." "He was a lovely man, massively talented, and we miss him," McCartney said. 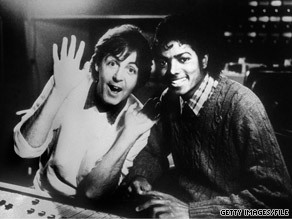 McCartney and Jackson collaborated on the songs "Say Say Say" and "The Girl is Mine," both released in the early 1980s. McCartney's appearance on Letterman marked the first time he'd returned to the Ed Sullivan Theater for a broadcast network show since the Beatles made their stateside debut there in 1964. The set included such Beatles and McCartney solo classics as "Get Back," "Band on the Run," "Helter Skelter" and "Back in the USSR."